Tony, thats pretty much the same as i do the cc 2v chambers. Simple and works really well with good detonation resistance. RL, im not sure what year that boss windsor/clevo head is, maybe Kazoom can give us the part number/casting number. Its an attempt at fixing the boss 302's inherent low/mid range. A decent cam would have helped more! You Aussie guys posting those closed chamber 2V heads realize what a novelty those are here? Like $500 a set bare on Ebay. I've got 2-3 sets upstairs still, all the povo pack 302C came with them, they are not exactly thin on the ground even now! KnightEngines wrote: I've got 2-3 sets upstairs still, all the povo pack 302C came with them, they are not exactly thin on the ground even now! More plentiful than the open chamber 2v in australia! Bos's5.0 wrote: You Aussie guys posting those closed chamber 2V heads realize what a novelty those are here? Like $500 a set bare on Ebay. a novelty is definalty what they were as the 4V made more power on the track and way Way over priced for a 2V at $500. cjperformance wrote: RL, im not sure what year that boss windsor/clevo head is, maybe Kazoom can give us the part number/casting number. Its an attempt at fixing the boss 302's inherent low/mid range. A decent cam would have helped more! they were early XE castings ment for 4 barrel windsor apps, i dont have any #'s, diffrent version of clevor?. small 2V and W int ports are way closer to each other in size which should make aussie's happy. 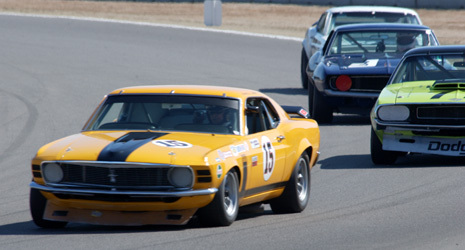 Yes in "1970" they (boss 302) were fine! By todays standards the boss 302 is not real impressive, build one using some modern aussie alloy clevo heads and you get a completely different animal. As time went by Ford knew the boss 302 / clevo 4v head was not fantastic, why would they go to the effort of casting up the windsor intake faced XE head with the same valve angles to allow for use on a boss 302 short block! They saw the XE head as possible fix to broaden the useable rpm range on the small ci engine. I'd love to see an intake port mould of that head, a wedge intake port height, narrow port, clevo intake valve angle, the short turn in them must be impressive! Dont get me wrong, im a Ford fan and i love the old ford muscle era engines/cars. And i appreciate you posting pics of things like that XE head. Its good to see rare stuff like that ive heard and read about but never seen. Good or bad i love the experimental stuff. That particular XE head was designed to be a lower cost '70 Boss production engine. The poor performance , partly due to the 240 cfm air flow of the intake port, caused the program to be cancelled and the revised '70 head ( developed simultainiously) won out. A friend in the San Francisco area has a pair on a running engine making over 400 hp. Power is comparable to an original C6FE headed engine using the same components. piston guy wrote: That particular XE head was designed to be a lower cost '70 Boss production engine. The poor performance , partly due to the 240 cfm air flow of the intake port, caused the program to be cancelled and the revised '70 head ( developed simultainiously) won out. A friend in the San Francisco area has a pair on a running engine making over 400 hp. Power is comparable to an original C6FE headed engine using the same components. Intresting, lower cost boss. If thats the case im guessing they planned to use the 4 barrel sjzed exhaust manifolds that use the 2 barrel port face like we got on some of our 2 barrel clevos here. Maybe a regular 4 barrel 302 w intake and retain the boss short block. Do you have any more info on them? piston guy wrote: comparable to an original C6FE headed engine using the same components. i heard the head was also thought about for the early 351 block?. anyway theres no rocket science needed for any 4V head with small ci/street eng to increase its int port velocity. put some tongues/fillers/stuffers in it. Hi , nice info guys, Does anyone have cutaway/dissected pictures of cast iron CC 4V cleveland cylinder head, intake port and exhaust port to share? F/S - CAST IRON FILLER WELDING RODS 5mm X 700mm Ship Australia & New Zealand wide. Hi Bos's5.0 , How many sets do you want , at $100 AUD's complete and for a pair of heads, which is $77 USD approx from early castings to the last castings. Hi unfortunatly not, i used to have a cut 4V and cut 2V on the counter, the 4V must have grown legs and walked away ! The thicknesses between the 2 were pretty much the same, I'd think that the thicknesses in the factory blueprints would have been the same and any difference head to head is just core shift. Hi Craig, thank you for the reply, from the 2V's stuff that i have dissected the material thickness seems to be very uniform but there are some variations and of course age has a factor into quality due to rust and deck thickness due to resurfacing services thro their life. So material casting margin wise to experiment around is minimal.